Justice Dinakaran is a Judge of the Madras High Court. A scholar well versed in law, he recently wrote an article in a leading national daily entitled, Law and Justice. 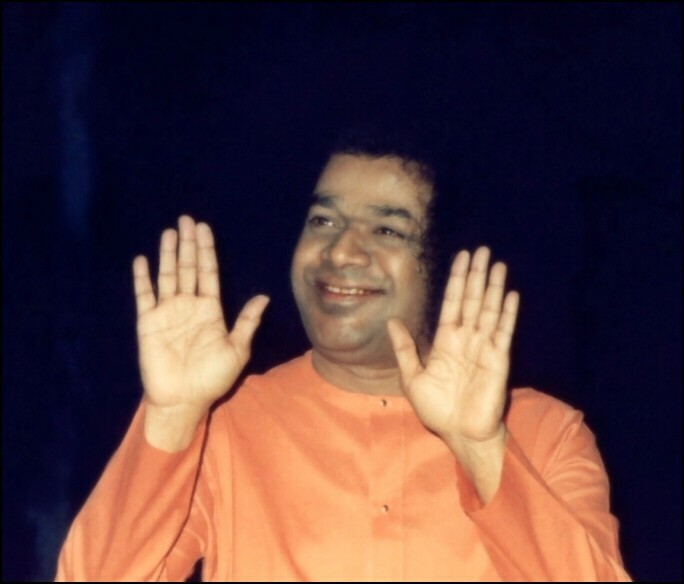 The article was supposedly secular but since it touched, unknowingly perhaps, a few basic aspects of Sathya Sai Baba’s teachings, we thought it might be useful to bring it to your attention. Justice means nothing else than conformity of the law of nature. Human law is subject to it, and if in any point it is directly contrary to the Law of Nature, it would no longer be law but a corruption of law. The excellence of Justice consists precisely in the fact that it is compounded of the truth, the good, and the beautiful. Truth is the foundation of justice. Goodness is the end and beauty constitutes its essential quality. Human law is a rivulet that flows from natural law, which, in turn flows from the Eternal Law. Modern man has turned liberty into self-will and licence, which he has tried to justify with his marvellous powers of reasoning. In truth, the mind of modern man is severely blinded by the cobwebs of false reasoning and trivialised knowledge. Times change, customs alter. But the history of mankind continues to testify to some constant and unchanging ideals, one of which is the concept of justice predicated upon humanitarian considerations. Well, that in brief is the essence of what Justice Dinakaran wrote. What attracted our attention to his article were his references to 1) Eternal law, 2) the origin of “human law” in Eternal Law, and 3) Truth, Goodness and Beauty. All these have strong echoes in the teachings of Sathya Sai Baba, and that is what we would now like to discuss. 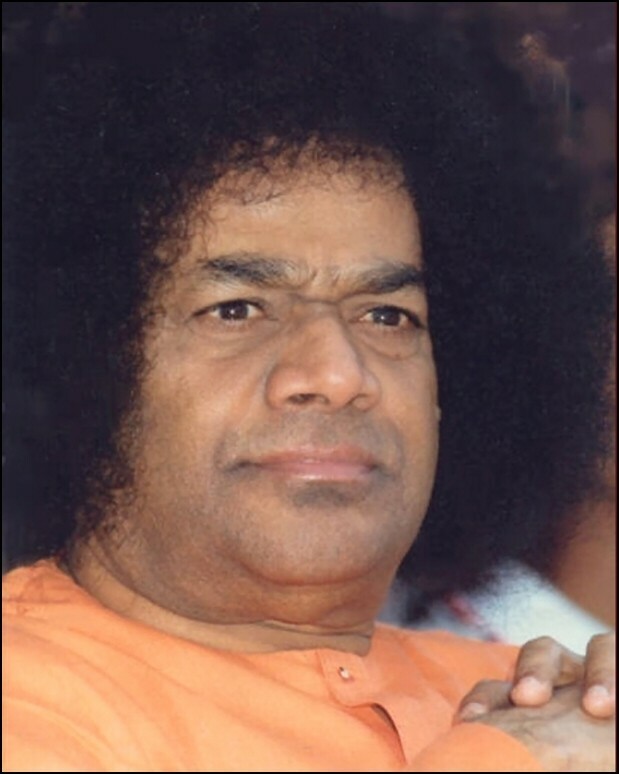 Sathya Sai Baba says that the human being is an Embodiment of the Divine Atma – in fact in earlier years He would always begin His Discourses with the word Divyatmaswaroopalara, which means exactly that. If we all are the Embodiments of the Atma, then it stands to reason that the actions expected of us ought to be in conformity with the nature of the Atma. Stated differently it means that our actions must be Selfless, Truthful, Righteous, Helpful and Compassionate, full of Love etc. We might loudly protest that all this is fanciful and not possible in this day and age. That is a different matter. 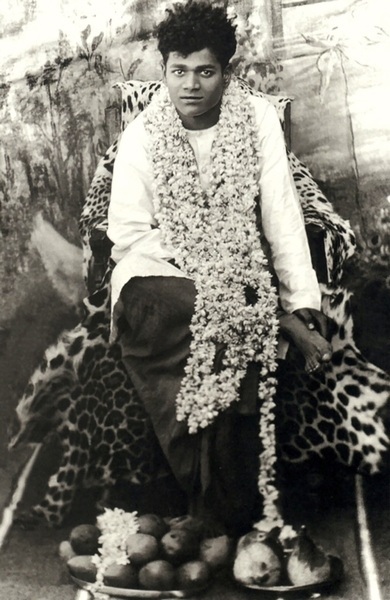 The fact is that just as one expects a King or the Prime Minister to behave responsibly and with dignity, and not as a joker, serious pursuit of the Spiritual Path places on us the responsibility of ensuring that our actions are as close to the nature of the Atma as possible. Now one might ask: “That’s OK, but what has all that got to do with Justice Dinakaran’s article?” We are coming to that, but first, we would like to introduce two key words closely related to the concepts discussed by Justice Dinakaran. They are: Atma Dharma and Para Dharma. Atma Dharma is the Primary Principle that must govern the actions of one and all, from the King to the pauper, at all times, and in all circumstances. Para Dharma, on the other hand, is a derivative of Atma Dharma, and essentially spells out what specifically must be done by whom and when. Thus, while the Primary Principle that governs all actions applies to everyone without exception, the Derivative Principle is not only individual-specific but also time- and situation-specific. All this may sound very mysterious and so let us recall some of the examples Swami Himself has mentioned. We will start with Atma Dharma, which is the Primary Principle. This just says that every individual, without any exception, must always act to be in harmony with the intrinsic nature of the Atma. Thus, considerations based on selfishness, hatred, anger, jealousy, etc. are summarily excluded – no justification available whatsoever. We hope that is reasonably clear. What about ParaDharma? It simply means Rules of Conduct that are individual-specific; and these rules must not contradict the basic principle or AtmaDharma. Let us illustrate by taking the case of a Teacher. To begin with, the Teacher must start from the Primary Principle and thus make sure that when he performs his duties as a Teacher, his actions are not tainted by selfishness, greed, etc. Remember, no one is allowed to be selfish, greedy, etc., and that includes the Teacher. For example, if the son of the Teacher is studying in his class, he must not show that son of his any special favour. Likewise, he must not make private deals with backward students, offering them private tuition for fees, and so on. Turning to the ParaDharma aspect or the Derivative Principle, here the do’s and don’ts are specific to his role in Society as a Teacher. Thus, he must be punctual, he must come fully prepared for his class, he must be neatly dressed and set a good example of behaviour to his students, he must go out of the way to help students develop their character and so on. In short, he must feel all the time that he is serving Society and through Society, he is serving God. 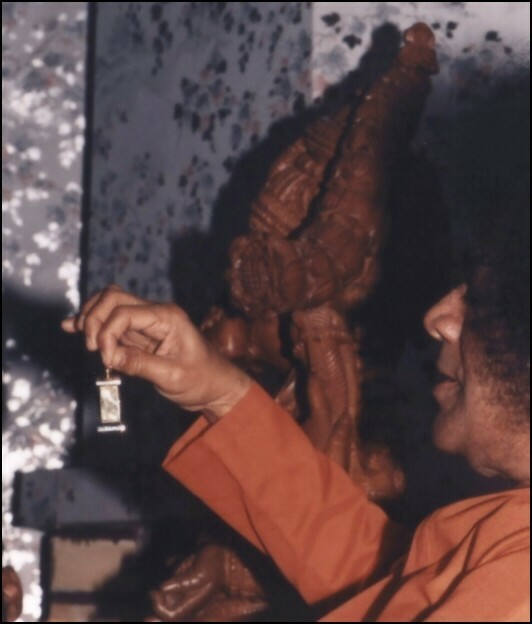 It all boils down to this: For all humans without exception, there is oneUniversal Guiding Principle governing every action in all situations and at all times; and that is what Swami refers to as AtmaDharma. AtmaDharma is also what Krishna explained to Arjuna in the BhagavadGita. Para Dharma is the manual, which decodes this Universal Guiding Principle and explains how individuals apply that to specific situations. By way of highlighting how Para Dharma is very practical and situation-specific, Swami says that a man who is the Chief Justice must appear in the Court in formal Legal Robes but when he is at home, he can wear casual clothes. Similarly, when a person is say fifteen, his Para Dharma is that of a student. At thirty when he is married and has a family, his ParaDharma is that of a householder. At sixty, his ParaDharma is that of a grandfather and so on. Same person, but with change of situation, the rules of conduct change. Though the ParaDharma might change, at all times and in all circumstances, the person must be truthful and follow the righteous path – that is how the core principle always operates. 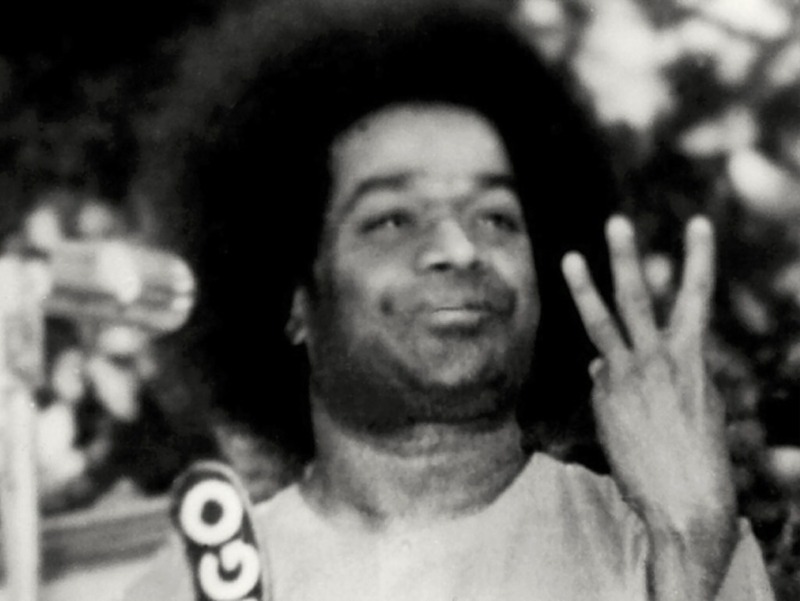 In passing, it is interesting to note the following: In the Rama Avatar, Sathya SaiBaba demonstrated to the world through every one of His actions, how ParaDharma must always be in sync with AtmaDharma. 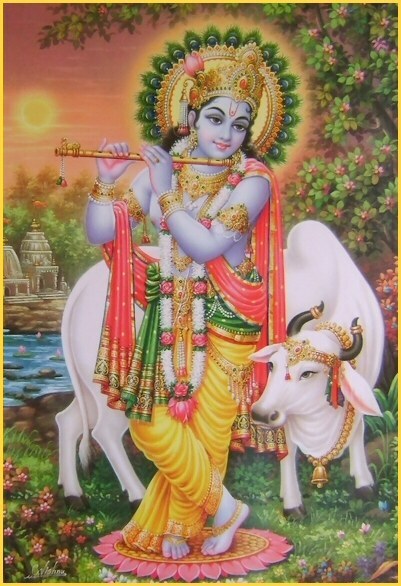 Later, as Krishna , Swami explained to the world what precisely is meant by AtmaDharma. 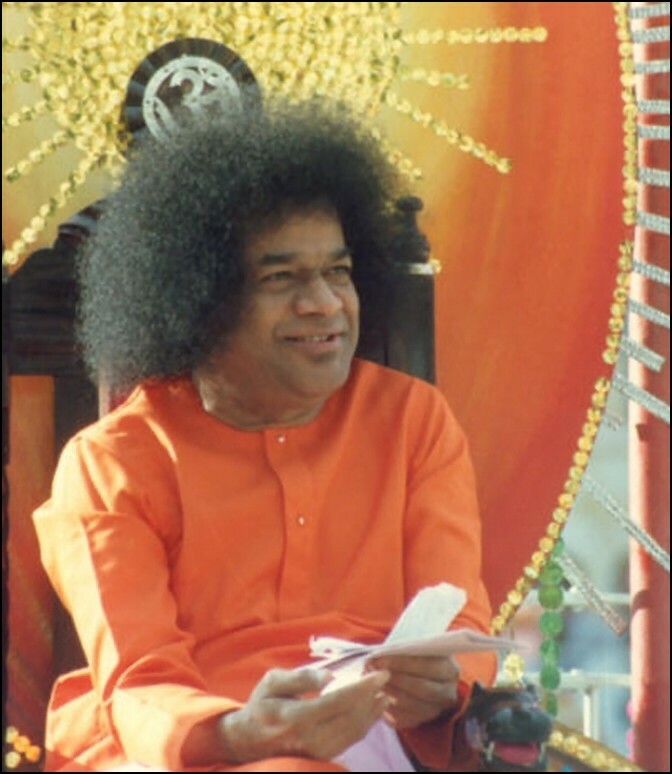 Finally, in the current Avatar as Sri Sathya Sai, Swami is not only giving us a continuous demo of Para Dharma in action but also explaining to us on every possible occasion, what Atma Dharma is all about. Now how does all this connect up with Justice Dinakaran’s remarks? In the following way: The learned scholar is of course concerned mostly about Law and its administration through Courts, but when he says man-made laws must be subservient to the Eternal Law, what he is saying is that rules for Society must be in conformity with a basic and fundamental as well as universal and Eternal Moral Principle. Many of today’s problems arise because law makers have distanced themselves from Morality. Thus, as a French savant once wrote, what is forbidden by Morality is now permitted by Law. This is reflected by the observation of many a Judge of the Indian Court that though they know the defendant is guilty, the loopholes of the legal system do not permit them to convict the person. Gandhi declared most emphatically that there is a Moral Law governing the Universe. Time there was when people intuitively accepted this. Thus, thousands of years ago when Emperor Manu codified for Indian Society the rules of conduct for people in various walks of life, the so-called Manu Dharma, he was essentially giving manuals of ParaDharma that were in full conformity with AtmaDharma. Similarly, when Bhishma on his deathbed instructed Yudhishtra on the rules of proper governance, he was merely laying out the ParaDharma of a ruler, in accordance with the general principles of AtmaDharma. In summary, while Justice Dinakaran has called attention to the fallacies of the modern legal system on account of their failure to respect the Eternal Law, we go one step further to point out what Swami tells us, namely that these days, most of the actions of humans are flawed because they are not in tune with the basic inner nature of a human being, that is the latent Divinity. As long as this true nature is forgotten, everything that humans do, in all spheres of activity, from governance to science, from business to arts, will be driven by selfishness and hence likely to be dangerous to the individual, to Society and indeed to planet earth. Thus it is that Krishna told Arjuna to always align his actions to AtmaDharma; Swami also gives us that very same advice. AtmaDharma is not any hairy fairy concept; it is very practical and very much needed in daily life. There is no need to discover it the hard way when it has been explained to us so many times in such pitiless detail. Do you agree? – From Bhagawan Sri Sathya Sai Baba’s Divine Discourse in Sai Sruthi, Kodaikanal on 29 April 2009 (Reference). 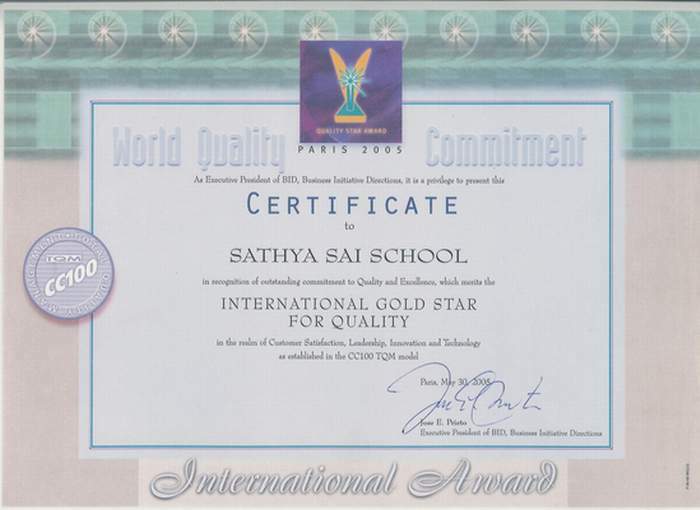 I am pleased to inform you that Sathya Sai School of Ndola has been awarded the International Gold Star Award for Quality in terms of leadership, innovation, training and excellence in education. 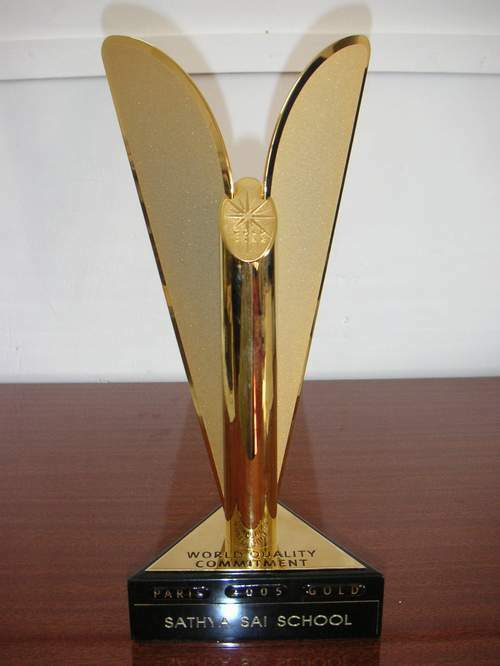 We received this precious trophy at an international gala dinner at the prestigious Hotel Concorde, La Fayette in Paris on 30th May 2005. Only Sathya Sai Baba could have made this possible. Attached please find the scanned copies of the trophy and certificate.